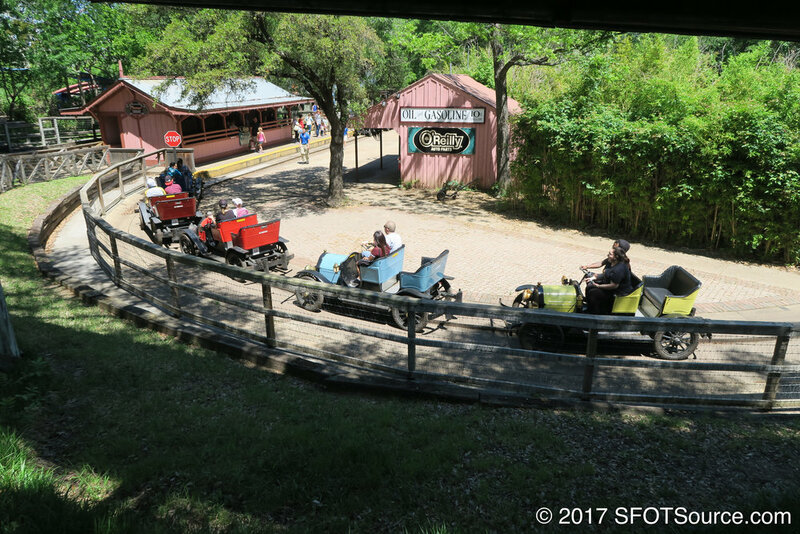 The Chaparral Antique Cars are the second-oldest continuously operating park attraction right behind Six Flags Railroad. The ride opened in 1962 and shared the same ride concept as Happy Motoring Freeway, but with an older style of automobiles. The Chaparral Antique Cars are themed after the Chaparral Motor Company that was based out of Cleburne, Texas. The Chaparral Motor Company began producing automobiles in 1911. Not much has changed with the ride today. The cars used to feature coverings that have since been removed. The original queue house, though not used for the Chaparral Antique Cars from 2011 to 2015, still sits intact as well as the original garage. Please Note: No single riders are allowed on Chaparral Antique Cars. The Chaparral Motor Company, which was located outside of Cleburne, TX, goes out of business due to the rising Ford Motor Company. The entrance to Chaparral Antique Cars is relocated next to Lone Star Theatre. The entrance to Chaparral Antique cars is moved back to its original location next to New Texas Giant.